4,000 children and young people develop cancer every year in the UK, and cancer is the leading cause of death in children aged 1-14 years in the UK. 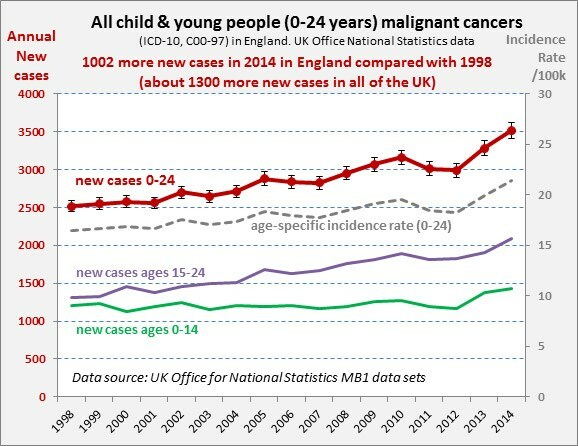 1300 more cancer cases a year* in children and young people (0 – 24 years) compared to 1998 at an extra cost of £130m per year to the NHS. Every day in the UK, 10 children and young people are diagnosed with cancer. Children with Cancer UK hosts an international scientific conference, showcasing state-of-the-art translational science in childhood cancer – London 5th-7th September. The reasons for this increase are unclear, but the number of children and young people diagnosed with cancer has increased by 40 per cent in the last 16 years, while the incidence rate per 100,000 has risen 30 per cent in the same period (the 10 per cent difference is due to an increase in population). These figures are from a new analysis of official ONS statistics by Children with Cancer UK, the leading national charity dedicated to research into childhood cancer. To coincide with Childhood Cancer Awareness Month, Children with Cancer UK is hosting Childhood Cancer 2016 (September 5-7), a three-day international conference showcasing state-of-the-art translational science in childhood cancer. Precision medicine is an emerging approach for disease treatment and prevention that takes into account individual variability in genes, environment, and lifestyle for each person. Greater investment in treatment for high-risk cancers with extremely poor survival rates – such as brain tumours, the biggest cancer killer of children. Kinder treatments, to reduce the impact that aggressive, toxic cancer treatments have on young patients as they transition to adulthood. Better understanding of the causes and prevention of childhood cancer. The second day of the conference (Tuesday 6th September) is dedicated to immunotherapy, which is the most promising new cancer treatment since the development of chemotherapy in the 1940s. Whilst it is still relatively early in development, modern immunotherapy offers real hope of curing young patients with the hard-to-treat cancers that have such a poor outlook today, and with a much lower burden of toxicity than the current intensive treatments impose on today’s young patients. 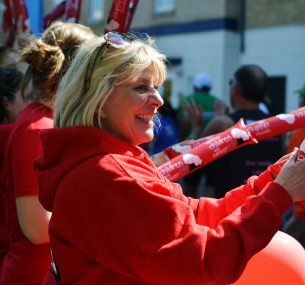 Children with Cancer UK is committed to supporting the ongoing development of immunotherapy for children with cancer and is funding a number of important projects at Great Ormond Street Hospital / UCL Institute of Child Health and other centres around the UK. “There is early evidence that precision medicine works in childhood cancers and can save lives. Crucially for young patients, such targeted therapies could also reduce the burden of toxicity, and help them to improve quality of life both during and after treatment. However, whilst some colleagues in the US and Europe are already systematically applying this technology to young cancer patients and seeing some success, efforts in the UK have been ad hoc rather than systematically applied in clinical trials. With cancer cases in children and young people up 40 per cent in past 16 years*, the third day of the conference (Wednesday 7th September) considers what we know about influenceable causes of childhood cancer, and the practical measures that might help prevent cancer in children. The 16-year overall rise is mostly due to teenage and young adults (TYA) 15 – 24 years old. The rises have been most stark in certain cancers, with colon cancer up 200 per cent, thyroid cancer more than doubled (110 per cent), ovarian cancer up 70 per cen and cervical cancer up 50 per cent. “These significant rises in cancer cases cannot be explained by improvements in cancer diagnosis or registration alone – lifestyle and environmental causal factors must be considered. We need a better understanding of the risk factors for cancer in children and young people, and whether there are practical measures that might reduce exposure to these risks. • To provide somatic and germ line samples within two weeks of diagnosis or relapse. • Initial funding to be led by charities such as Children with Cancer UK with a commitment from the NHS to fund as service after proof of principle in clinical trials. • DoH to rapidly establish multi stakeholders’ group to define ethical guidelines for genetic testing in paediatric cancer drawing on international expertise. • NHS/DoH to develop quality framework for genetic testing including pre and post analytic quality assessment. • Genetic and clinical data to be stored in a secure digital personal medical record. • On-going support of a national molecular tumour board of scientist. and oncologist. that makes treatment recommendations based on personal medical record. • Precision cancer medicine in children to be given a central place in the evolution of UK strategy for analysis of big data in healthcare – so that key data from individual digital personal records can be used anonymously to refine the predictive value of testing for future patients..
• Pharma incentivised to make “targeted drugs” known to have potential activity against a molecular lesion found in a patient’s tumour available for children, and to work harder to provide child-friendly drug formulations. • Regulators and commissioners to accept, facilitate and fund off-label use of targeted drugs in children if recommended by national / international tumour board. • Priority given to development, and participation, of the UK in both small proof-of-concept and large scale multinational trials of targeted therapies. Children with Cancer UK is the leading national children’s charity dedicated to research into cancer in children and young people. Inaugurated in 1988 by Diana, Princess of Wales in memory of Jean and Paul O’Gorman our aim is to improve survival rates and quality of survival in young cancer patients and to help research ways of reducing cancer incidence. Every year we invest more than £4 million in new research across the full range of childhood cancers. We currently have more than 60 projects under way at leading centres around the UK. Childhood Cancer 2016 is an international conference showcasing state-of-the-art translational science in childhood cancer, taking place at Church House Conference Centre, Dean’s Yard, Westminster, London SW1P 3NZ on 5th-7th September 2016.